Monoclonal antibodies are produced by a type of artificial cell combination called a hybridoma. It consists of a cancer cell (the flat blue cell) fused with a B cell (the round green cell). The cancer cell contributes rapid and continuous division; the B cell secretes a single antibody type (7,000x). slowly releasing viral antigens after an initial infection. This constantly stimulates memory B cells, which present the antigens to T cells, maintaining immunity. 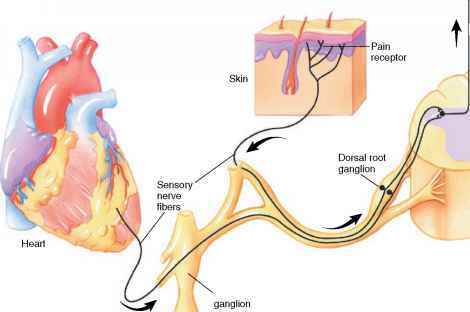 As a result of a primary immune response, detectable concentrations of antibodies usually appear in the body fluids within five to ten days following an exposure to antigens. If the identical antigen is encountered some time later, a secondary immune response may produce additional antibodies within a day or two (fig. 16.23). Although newly formed antibodies may persist in the body for only a few months, or perhaps a few years, memory cells live much longer. 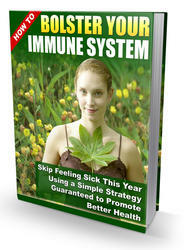 A secondary immune response may be very long-lasting. Each year, a few children are born defenseless against infection due to severe combined immune deficiency (SCID), in which neither T nor B cells function. David Vetter was one such youngster. Born in Texas in 1971, he had no thymus gland and spent the twelve years of his life in a vinyl bubble, awaiting a treatment that never came. As David reached adolescence, he wanted to leave his bubble. An experimental bone marrow transplant was unsuccessful—soon afterwards, David began vomiting and developed diarrhea, which are signs of infection. He left the bubble but died within days of a massive infection. Today, certain types of SCID can be treated with enzyme replacement or experimental gene therapy. 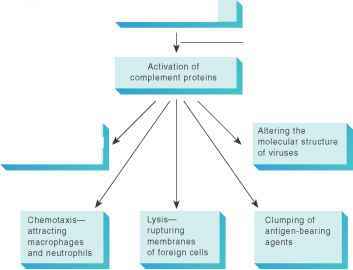 Actions of the complement system.